Website platform choice can be a religious war. I learned this the hard way last week when I stumbled into the middle of a debate between a pro-WordPress.org faction and a pro-SquareSpace.com faction in an online group. I love both, just like I love both dogs and cats. However, I love each website platform for very different reasons. I love SquareSpace because it is superb for DIY entrepreneurs who want a pretty site — especially an eCommerce site — with little maintenance and without a need to know the code. I love WordPress because of the number of customizable options, and the ability to control the site’s design, speed, SEO, and look. Each website platform also has drawbacks. Squarespace is limited in terms of the number of available themes and control over the technical side of the site, such as load speed and SEO. 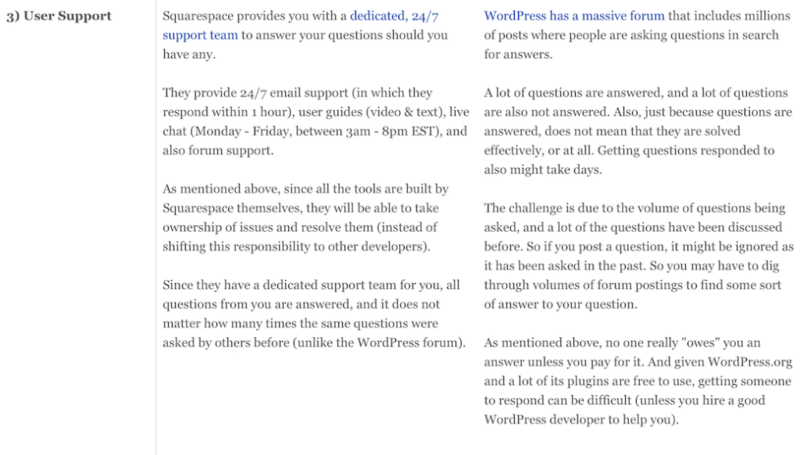 WordPress plugins can be buggy, and with self-hosted WordPress, you may not have access to 24/7 customer service, as you do with Squarespace. In order to help stifle the religious debate, and to make the choice more obvious on a customer-by-customer basis, I am posting these high-level summaries, along with the links for further reading. If you would like to compare other website builders such as Wix, Shopify, and Weeble, in addition to Squarespace and WordPress, this article is a goldmine and it will save you a bit of time and effort. (1) WP Curve offers this high level summary of the pros and cons of each platform. The author follows up this table with a more detailed discussion of comparisons between the two platforms that involve: ease of use, ability to customize, design, eCommerce, pricing, plugins, stability, scalability, and support. (2) Websitebuilderexpert offers this slightly more detailed summary of the pros and cons of each platform. 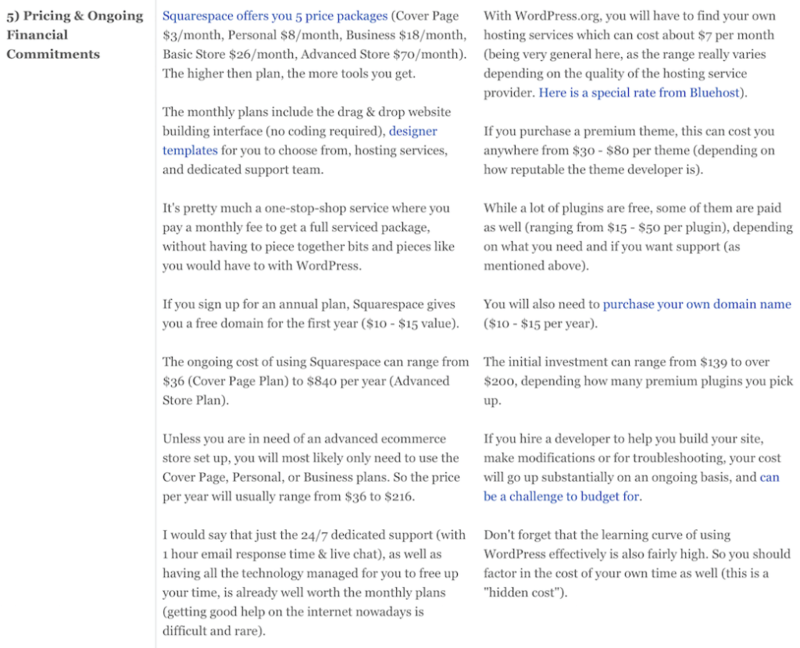 The author offers a review of SquareSpace, if you would like to learn more. There is not a review of WordPress, simply an article about how to install it with a particular hosting company. This author nails it. My philosophy has been that it is about what works best for the client, not my ego. For some clients, that might be Squarespace; for others, it is WordPress. The goal is a client-centered website platform and design, not the web designer’s ego-centered website platform and design. I always say this. When picking a service in any scenario, there is no one-size-fits-all approach. The first step is to not take a step. Sit back and really think about the project you are approaching with your client. What are the immediate and long-term needs? What is the technical ability of the person who will use the site most often? [Do you know] your client’s budget? What will this site or business look like in a few years? 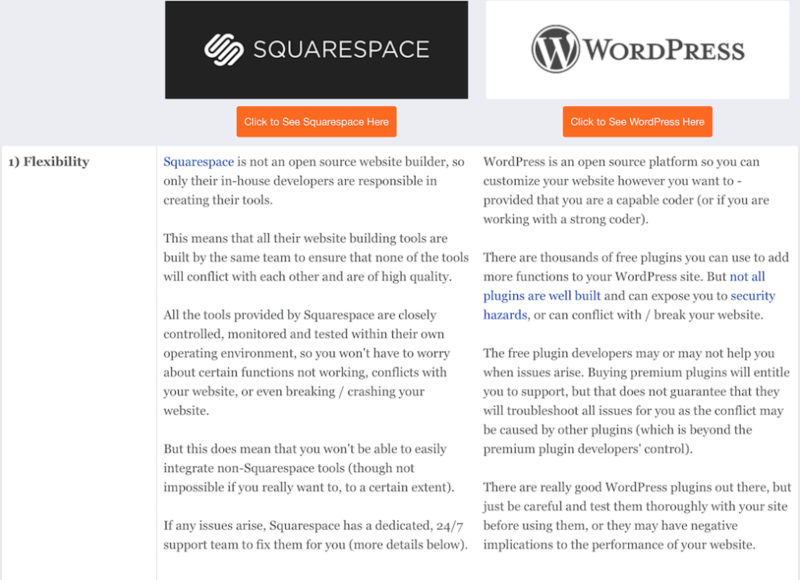 These are all questions to consider when deciding on Squarespace vs. WordPress. As well, both the client and the web designer need to focus on the value of each platform to the client. The less expensive option may not be the better option over the longer term — i.e., 2-3, or even 5 years. I can say this though – cheap is not always better! I would not make a choice of what website platform to use based on cost alone, but rather on value, and the above-mentioned factors that we’ve discussed in this article. If you try to go cheap now only for the sake of going cheap, you’ll probably end up spending more in the long run if you pick the wrong solution for your needs. Exactly. I could not have said it so succinctly myself. 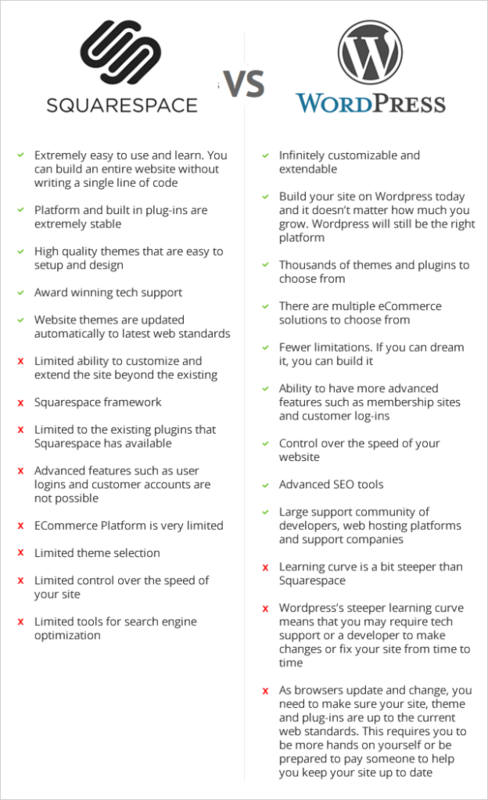 The choice between the WordPress and SquareSpace platforms should be made based on a rational comparison of the pros and cons of each, and how that fits into the clients current and future goals, and budget. If you would like to work with me to improve your SEO with either WordPress or SquareSpace, please see my SEO services page. Yes, do let me know. The designer in me found the limitations frustrating, but the DIY advocate in my loves how simple it is for people with little to no Web experience to use. Thank you for your offer of feedback. I’m trying to make this blog useful to people.